The big news for the 2018 Dodge Durango is the new 475-horsepower Durango SRT. With 470 lb-ft of torque and permanent performance-biased all-wheel drive, the Durango SRT is designed to be the perfect hauler for families in a big hurry. The rest of the lineup also gets updates, such as adding Apple CarPlay and Android Auto to the infotainment system. I love the Dodge Durango for the spacious interior. It has three row seating and seats seven people. And in the back there is a storage space underneath the floor. As well as the space behind the seat for storage. It handles very nicely. Dual climate control as well as rear climate controls. One issue that I have that I do not like is my phone does not automatically pair up with the vehicle. I have to manually connect it each time. And that is annoying. Another thing is the tailgate is very heavy to pull down from overhead. It does not automatically come with floor mats for the third row seating. Which, I think it should. Every rose should have floor mats. I don't like the carpet color, it's black/charcoal. It does show a lot of dirt. And, lastly, I don't like that there is no USB ports in the middle of the vehicle. There's two in the front, one in the consul, and one in the way back At the storage section. But there is not one in the middle for people in the backseat. Luxury love and a beer budget. I love my car! I could not ask for better when it comes to my Durango. It drives like a dream. It feels like it floats above the road, it drives so smooth. The exterior is absolutely beautiful! Its sleek and tailored and sharp. It's so luxurious without the luxury price tag. The interior is the same way. The features that it has are amazing. There are features that I never thought that I would have. The lay out of the inside is so spacious and roomy and very well made. The leather suede combo is just such an extra touch that really makes the vehicle pop. It makes it feel very luxurious. 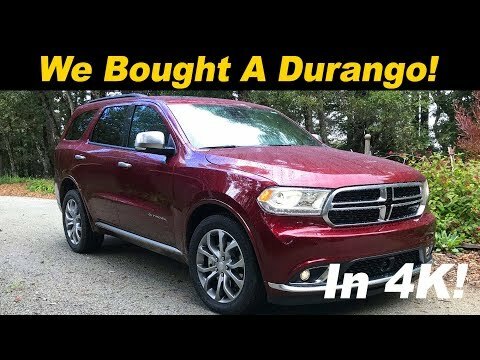 Over all, I absolutely love my Durango and would absolutely buy another one!